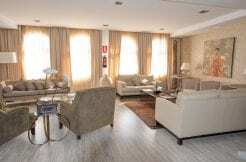 Spacious Ground floor apartment located in the exclusive and luxurious urbanization of San Roque Club, surrounded by 2 prestigious golf courses and 5 minutes from the Port of Sotogrande and its beaches, and 10 minutes from Gibraltar Airport. The accommodation comprises of 4 bedrooms ( 3 Doubles of which 2 are ensuite and one bunk bed room), 3 bathrooms, a fully fitted kitchen and a generous living room. All the rooms have direct access to an outdoor terrace, a large private garden with a private designed heated pool and a jacuzzi. Spectacular unspoilt South West views of the Campo, all day sun and peaceful setting. Other extras: Air Condition Hot and Cold throughout, 2 private parking spaces and large green areas including a community pool.